Priscila could absolutely not wait to marry her Prince Charming. 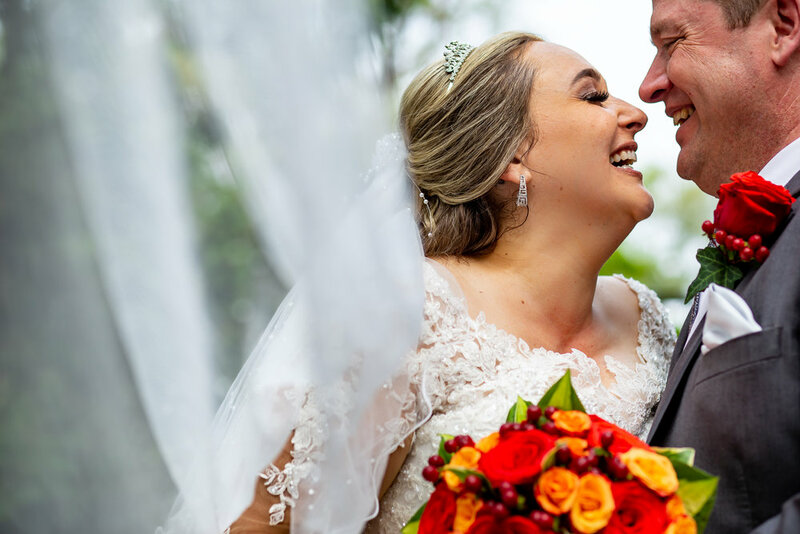 While many brides confined in us that the stress of planning their wedding has been overwhelming and weighing them down, Priscila was loving the whole process, and would excitedly give us updates on her progress during each step of the way. Priscila & Randy’s Old Mill Toronto wedding was full of elegance and emotion. 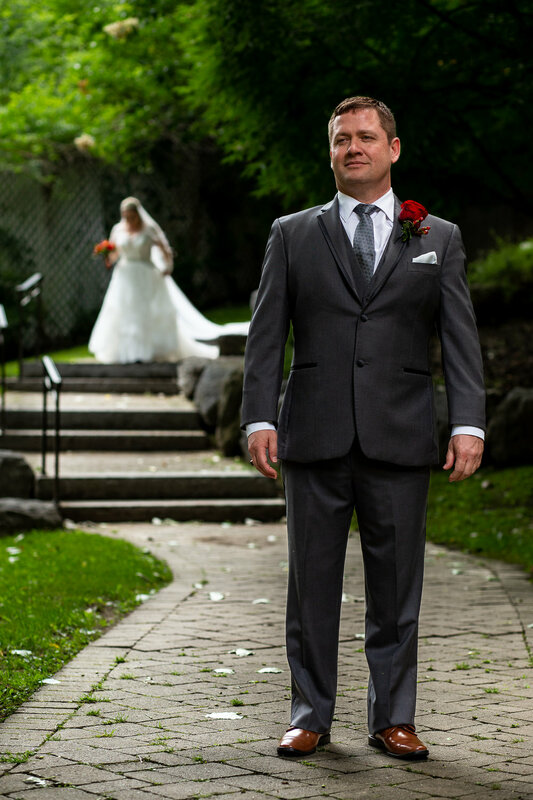 One of the wonderful things about having your wedding at Old Mill Toronto is that your whole day can be onsite, without the need to get from one place to another, worry about transportation, and traffic. It’s a huge time, and stress, saver! 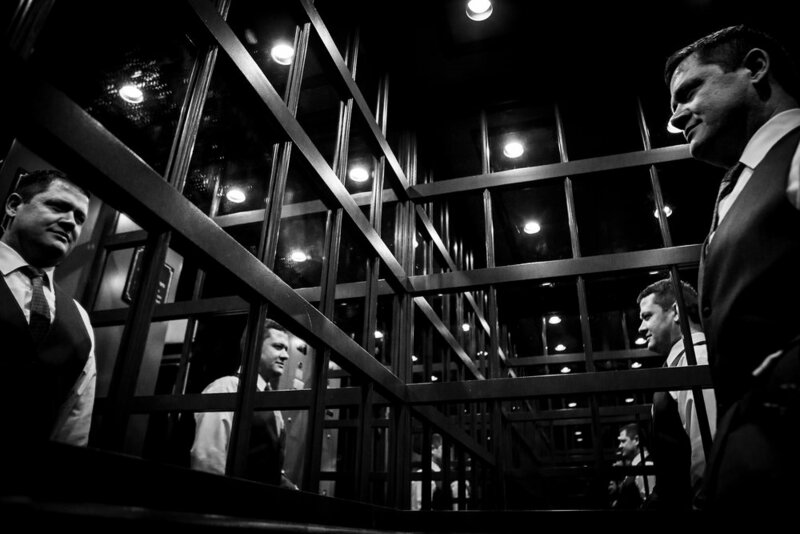 The Old Mill Toronto hotel holds luxurious rooms, ideal for the bridal party to get ready in. Priscilla and all her family and friends comfortably got ready at one of the multi-room suites. 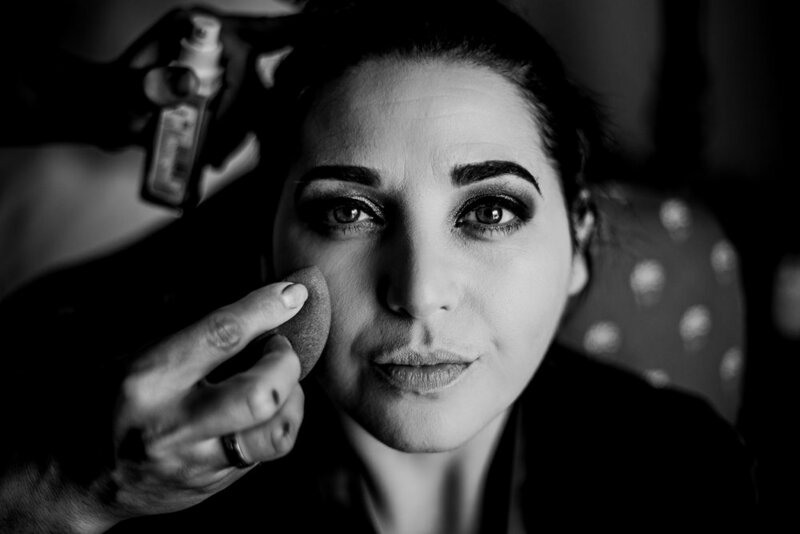 When we arrived to capture Priscilla getting ready, hair and make-up was already underway in each one of the rooms. There was excited chatter as friends and family members who just arrived from Brazil for the wedding were catching up and trading stories. Priscilla, in all her excitement and happiness, could not contain her tears as each new person arrived in her room to see her get ready. 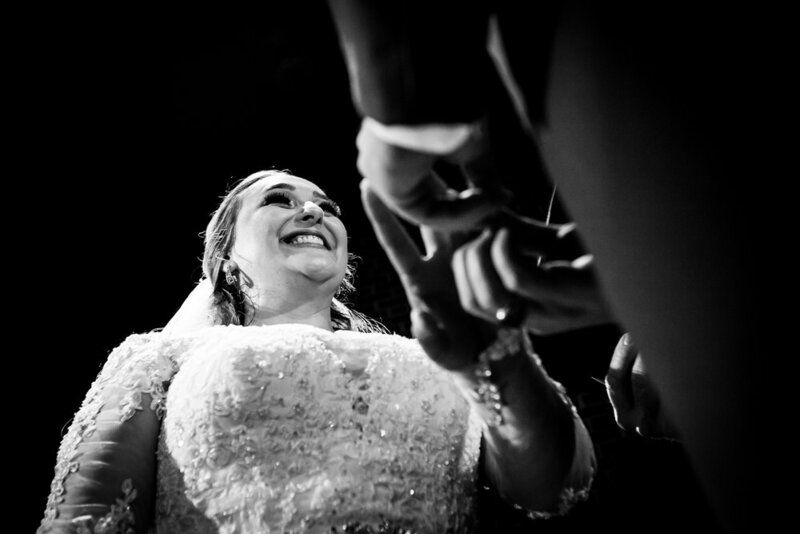 Once Priscila put on her dress and her tiara, her vision truly became a reality as she looked like a proper princess – stunning in her long-sleeved lace wedding gown and long veil. She was now ready to see Randy at their first look. Randy got ready with his closest friends, who helped him put on the final details and occasionally playfully smashing a pillow in his face. It was definitely a quieter atmosphere compared to the ladies getting ready, but no less emotional. It was clear Randy was ready to see and marry Priscilla, and could no longer contain his nerves when he saw his sister step into his room to see him looking dapper right before the wedding. The big reveal took place in a quiet and intimate garden. The spiralling stairs and the long paved path was absolutely perfect for their first look. Tears started to follow before Prsicilla even made it to Randy – they have both been waiting for this day with such excitement and anticipation, and it all came down to this. 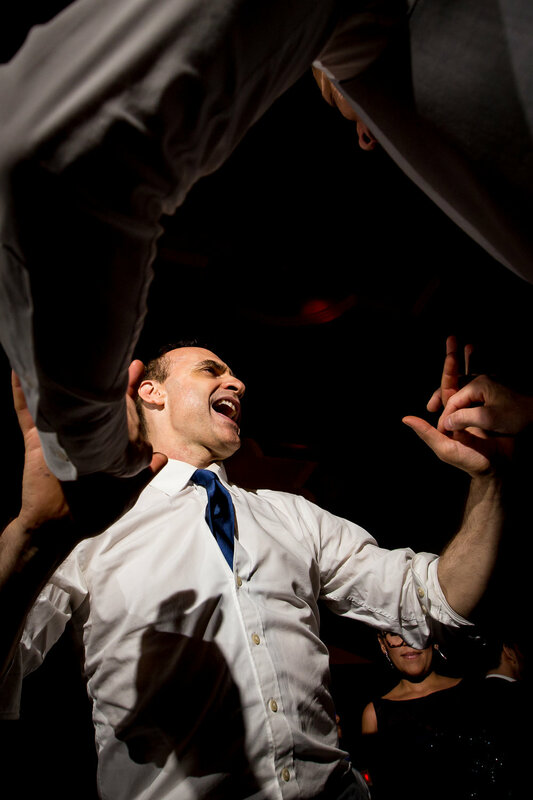 As Randy turned around to see his beautiful bride, their faces lit up in simultaneous joy, laughter, and tears. We were so happy to have been there to capture such a real display of love and deep commitment. The ceremony was held at the Old Mill Toronto Chapel. 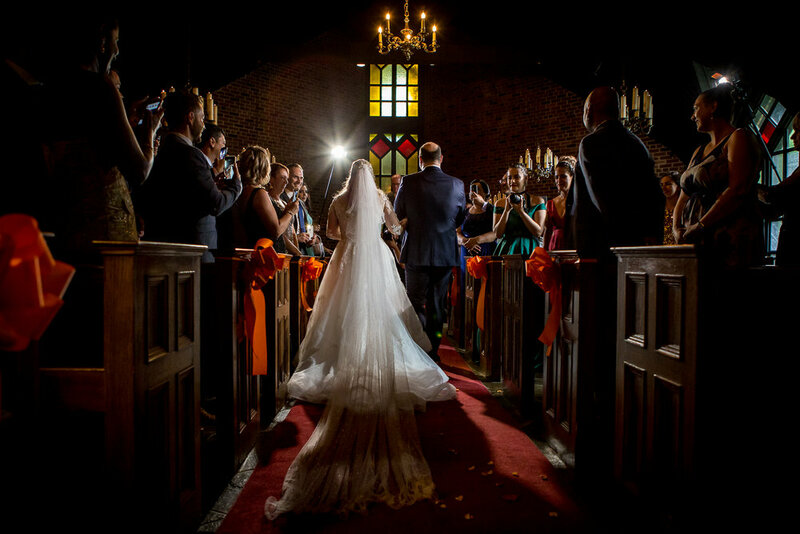 The ceremony felt so magical as the stained glass windows, candles, and chandeliers lit the chapel with a warm glow and the piano set the mood. 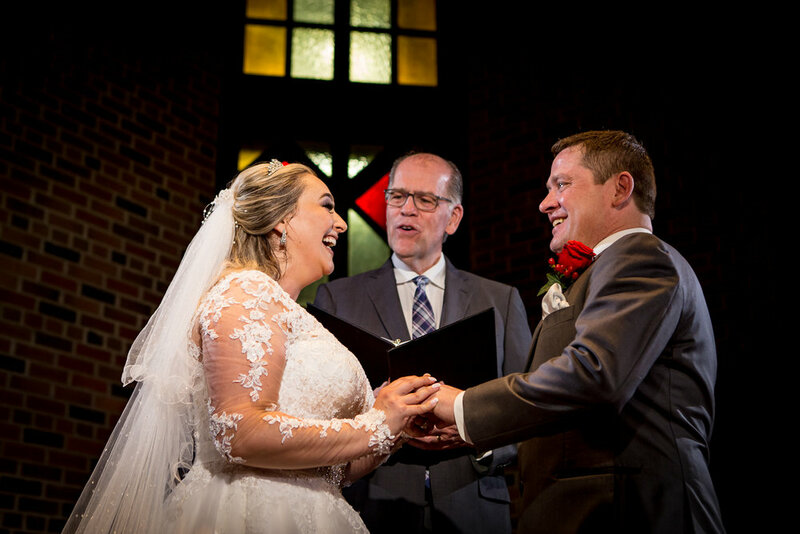 Priscila and Randy were both beaming and smiling ear to ear as they said their I do’s and then walked out of the chapel holding hands, elated to be husband and wife. Having been pronounced husband and wife, Priscilla and Randy were now ready to celebrate with all their friends and family. They surprised everyone at the reception with Brazilian treats and a caricature artist, who did a wonderful job at capturing everyone’s unique and special qualities. When it came time for speeches, so many people wanted a turn telling Priscila and Randy how special they were to them, how much they loved them, and how happy they were for them. Everyone was crying, including us. That being said, as soon as the dinner was done, the party started and did not stop until the lights were on. Everyone was having such a blast being silly with our Loopy Photobooth props and dancing the night away that we didn’t even notice the time. It’s always sad to leave our couples for the night, but especially when the couple and their guests give us so many amazing photo opportunities. Priscilla and Randy, thank you so much for having us be a part of your big day to capture all the special, emotional, and silly moments! Beijos!